I must have said 10 times how delicious this was as we were eating! 1 tsp each of rice wine vinegar, tamari, sesame oil and worchestershire. 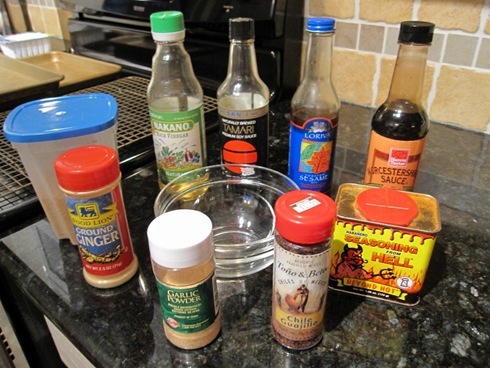 Plus about 1/2 a tsp each of brown sugar and ginger and just a pinch of garlic powder, chile flakes and Seasoning From Hell (cayenne). Mixed in a bowl and slathered all over the tofu. I just created this page for your enjoyment: Tofu Tutorial. Baked at 425* for about 40 minutes = Perfection! I also put sweet potato fries and parsnip in the oven. They weren’t exactly crispy, but they were still a good consistency for eating. I cut a huge sweet potato into quarters and microwaved it for 2 minutes to soften it to make it easier to cut and move the cooking process along a bit. Then I cut into fries and sprinkled with 1/2 a tsp each of Seasoning From Hell, cinnamon and olive oil. The combo of spicy and sweet was awesome!! I baked them for about 30 minutes at 425* and we broiled them for the last 3 to try to get them to crisp. I think it worked a bit, but not too much. The pieces with skin on them crisped the most. Be sure to cover your pan with cooking spray so they don’t stick! 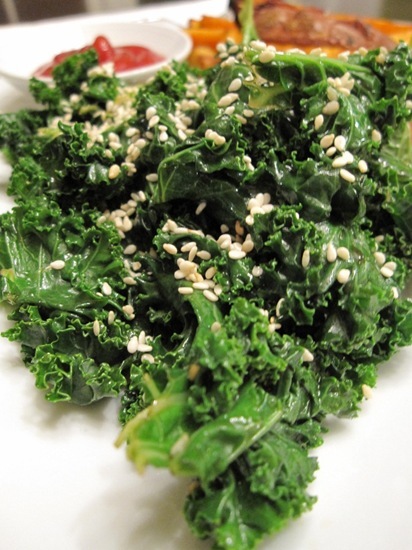 Lastly I made a Sesame Kale Salad. We took about 4 fluffy cups of cleaned and trimmed kale and steamed them in a metal collendar over some boiling water for 2-3 minutes, just until it turned bright green. Then we tossed that with a combo of sesame oil, rice wine vinegar, tamari, SFH, and a pinch of salt. And topped all of that with some toasted sesame seeds. I wish we had some left for leftovers because I bet it would have been even better tomorrow! Even after all of that, our “Two Cooks” morning was still more hectic! I never check my spam folder until someone alerts me that their comments are not posting. Someone did today and sure enough, there were quite a few of you regulars in there! The problem? Links. My spam filter (which gets tons and tons of jibber jabber each day) does not like it when you put your blog address in your comments. So please put it your name link and hopefully you won’t get caught in the web! We’re done with dinner early again tonight so I’m going to relax for a bit. I can’t bring myself to do school work in the evenings quite yet. Only if I have a test! Tomorrow’s I’m already looking forward to my T/TH ritual followed by a day of really trying to study. Blarg! Yum yum!! Definitely the perfect meal 🙂 And vegetarian to boot! Thanks for the sweet potato fries recipe! They look delicious. Sweet potatoes, tofu? You won me over. Yum! I had GC tofu and sweet potato last night! 🙂 It doesn’t get much better. Oh I love sweet potatoes! Definatly in my top favorite foods ever! I have a question. I noticed the other day you ran 5.5 miles and i’ve noticed that when you do run, it’s usually a good bit. Me, i’ve always been one who hates running. I guess I just don’t have very much endurance. I’ve been jogging/walking for about 7 months 3-5 times a week. I’m fairly short so anything above 6mph is sprinting for me. I walk at 4 mph and jog at 5 mph and then run usually at 6 or 6.5 mph. But when i do run, it’s like sprints, can’t do it for more than 3-4 mins max. I feel like a wimp when i see that you run 5.5 miles in one sitting while i can only do 2.5 or so of running and jogging in 30 mins. I was wondering if you’ve always been able to run distances or is this something that you have built up over time? Thanks! If not, this is scary. I called it the perfect meal too, and it was: gliding calm tofu, sweet potato fries and kale. I’m seriously freaked out right now. I must try that GC tofu soon! That dinner is perfection on a plate! looks phenomenal, kath. i have plenty of work to do tmrw as well! YIKES! Holy yum- that dinner looks perfect! I have yet to try the baked tofu…I’ve always been afraid of tofu, but then again I was afraid of kale and I love it in smoothies now. I noticed that some of my posts weren’t getting added, and then I figured out it was the link in the post and that stopped it. I never check my spam folder too- no time! Your kale salad looks so good. I’d never had kale until I tried your kale chips recipe. Now I love it! I agree! I pretty much eat a sweetp everyday!!! Awesome looking dinner. Still jealous of all those people who can make sweet potato fries without burning them…mine just never turn out! Now I’m thinking that I’m having a sweet potato tomorrow…. mmm i agree, swee potatoes are the best! Totally agreed. Sweet potato and I are BFF. Seriously. LOVE IT. I love your sweet potato fries..Im going to have to get some of your recipes down so I can start this healthy eating style like you all! 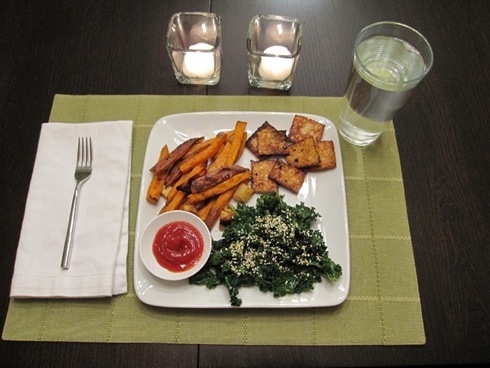 Everything looks delicious, especially sweet potato fries! One of these days I need to attempt them! 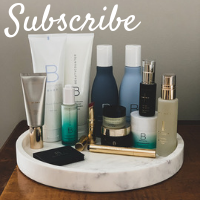 Two words – SIMPLY AMAZING! hey Kath, I’ve been reading (and loving!) your blog for a while now, and I thought I’d finally leave a comment. 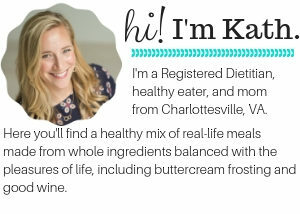 Two things: (1) your stuffed pork tenderloin recipe absolutely saved a dinner party I recently hosted, and (2) your kale salad here looks delicious! I STILL haven’t tried the GC tofu – I think I need to! And quick! 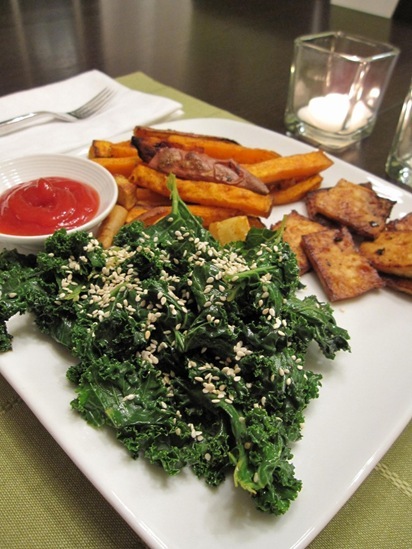 Hmm what’s better… kale like this, or kale in a smoothie?? I didn’t realize you cut the tofu so small, I usually cut a block into 4 or 6; I have to try this next time it looks much crispier! Wow, that IS the perfect meal! 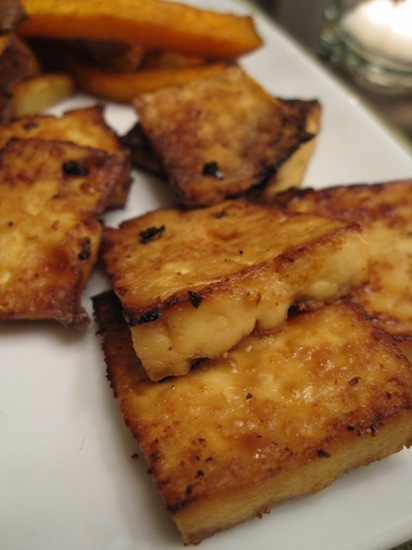 I am dying to try baked tofu – thanks for the tutorial! Also, looooove sweet potatoes! I have been experimenting lately to try and get them crispy though. I haven’t mastered the “fries” yet, but I think I nailed the sweet potato chip! You can check out my blog post called The Sweet Experiment to see my method. Let me know if you try it! I am on a mission to figure out how to make sweet potato fries crispy in the oven, but I haven’t managed it yet. Let us know if you have any breakthroughs! I am always eating sweet potatoes. I love the tofu! What a yummy dinner! K, you are going to have to fix me some tofu :). I have never likes it because of the texture, but yours always looks so yummy! that really does look like the perfect meal! the tofu and fries look very yummy! Looks DIVINE. I wish I could make myself a meal like that. What does kale taste like? I must try this tofu!!! What camera do you use? I can’t get close ups of my food with my camera. It just turns out blurry. Your pictures are great! Sweet potatoes and spinach are tied for my favorite vegetable right now. 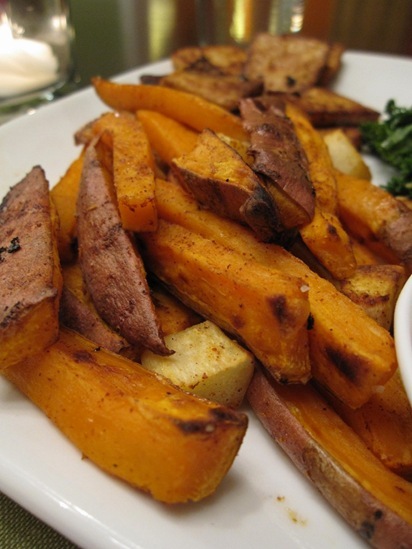 I like baking the sweet potato and topping it with salt, pepper, cayenne pepper and sour cream. I’ve really always liked running. I just go out there and keep putting one foot in front of the other. The big secret is you do not have to go fast!! Just keep moving. And it will get easier and easier the more you run. I didn’t see that post, but that’s too funny. mmmm I think we bought the same things at the grocery store this weekend! 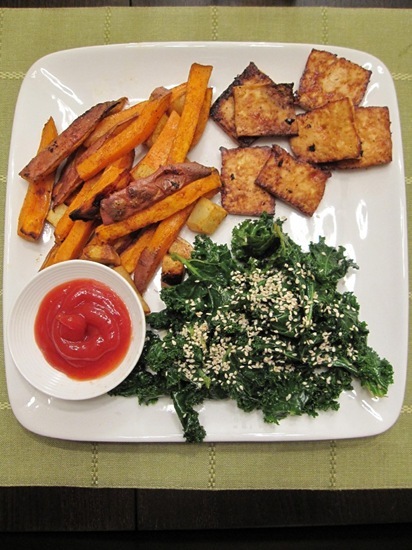 gc tofu seems to be the food blogger dish of the week :-). i am going to try your sesame kale — i still have a bunch left. yum! Thank you SO much for the tofu tutorial. I love tofu, but have struggled to find tasty ways to prepare it at home. You are such a complainer. This meal took 15 minutes of hands-on time. The rest was just baking. 40 minutes is a long time, plus 15 minutes of prep work. I’m not criticizing your meal Kath, chill. It’s great you have time to do this. But for me and I’m sure many others who come home late, have to hit the gym, and THEN worry about eating, it’s just not feasible. I’m jealous you can do this. that dinner looks so bright and lovely! so making this tonight Kath THANKS!!!! You inspired me and I finally made Baked Tofu, holy yummers!!! !